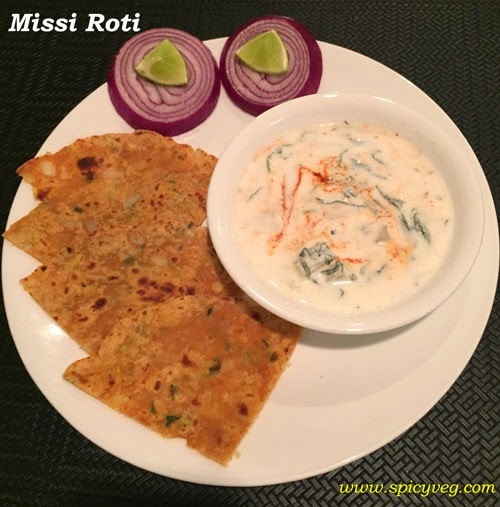 Missi roti is an authentic recipe of Rajisthan. 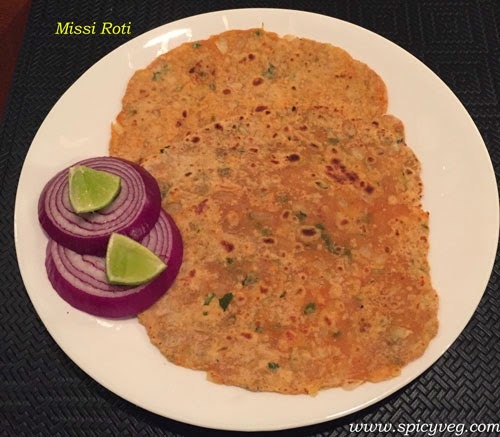 Rajisthan’s most recipes have a strong base in Gram flour (besan) .The Missi roti tends to get dry, so it good to serve it hot along with butter, favorite dal or Raita. 1.In a big bowl add wheat flour and gram flour. 2.Now add salt, ghee and Red chilli powder and cumin powder. 3.Add chopped fresh coriander ,onion, and grated cauliflower mix well. 4.Now add water and make a medium dough. 5.Cover and rest for 5 minutes. 6.Make equal sized balls from the dough. 7.Dust the ball with wheat flour and roll to make a medium thick roti. 8.Place the roti on a medium hot griddle/tawa and cook from both the side till it changes its colour and get few golden spots. 9.Cook from both the sides till get few golden spots all over.